Can you imagine what it would be like to have your brand absolutely crushing it in your niche market? While most entrepreneurs can imagine what success and fortune would look like, getting there is the hard part. On this episode of The Amazing Seller, you’ll hear from Scott as he reveals his three pillars to building your brand. Scott doesn’t just talk the talk, he’s been there at the very beginning and has the battle scars to prove it. Take this opportunity to learn from Scott’s expert perspective and find out what it will take to get your ecommerce brand to the next level of growth! What does it mean to build a brand? Is brand building just slapping a logo on your products and selling them? How difficult can that be? Or is there more to brand building? On this episode of The Amazing Seller, you’ll hear from Scott as he explains the ins and outs of brand building and what sellers like you can do to build a brand that will go the distance. At the end of the day, Scott’s version of brand building comes down to establishing yourself as an authority in your niche market and building an audience. While it’s not an easy path, Scott stresses that this brand building process will lead you toward sustained profitability and growth. Hear more from Scott on this important topic by listening to this episode! Have you built your home base yet? If you have any hope of building a thriving ecommerce brand, you’ve got to get to work on creating a “Home base” for your brand. While the term may sound intimidating and complex, it doesn’t have to be. All you have to do to get started is go to WordPress or any other hosting site and start building a website with a blog. From there you can add components like an ecommerce store and landing pages. Don’t delay on this vital step! Get Scott’s helpful tips on getting a home base up and running by listening to this informative episode, you don’t want to miss it! Build an email list and use it! Have you been convinced that you should build an email list for your brand yet? What are you waiting for? Building an email list is a sure-fire way to connect with your audience and create an asset that you can use with any platform or channel. 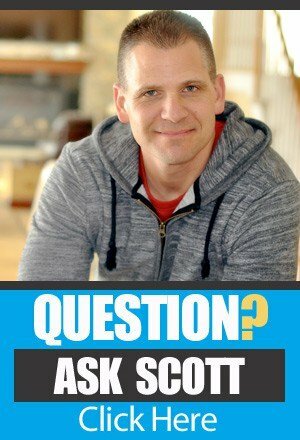 If you are intimidated by the email list building process, let Scott guide the way! On this episode of The Amazing Seller, you’ll hear why email list building is so important, how you can use it effectively, and what it takes to get started. Make sure to check out the resources section of this post for a link to the email list building workshop that Scott put together for TAS followers like you! External channels can help you build your brand’s presence. One of the best ways to connect with your audience and build your brand’s presence on the web is by investing time and resources into external channels like YouTube, Facebook, Instagram, and others. What does building up those external channels look like? On this episode of The Amazing Seller, you’ll hear from Scott as he walks through an example that sellers like you can use to get the ball rolling on your external channels. Don’t overcomplicate it! Find out what it takes to get your brand off of the ground and connecting with your target audience by listening to this engaging episode! [3:30] What does it mean to build a brand? [5:30] Why Scott is creating content on YouTube. [13:30] Build an email list! [17:30] Create external channels for your audience. [21:30] Why you need a Facebook fan page. [25:00] Scott gives an example of how to utilize a channel like YouTube. [29:30] Scott recaps all three pillars of building your brand. …building your brand to dominate your niche or your “neesh” depending on where you come from or how you pronounce it, basically your market. Here’s the deal. There’s a lot of people getting started on Amazon, so I get the question, “Scott, is it still possible for us to start our brand or to start selling on Amazon?” and the answer is yes but it is going to be more difficult if you aren’t doing external things and you’re not building assets. Now, you guys probably heard me talk about that quite often. Actually, in the last episode, 524, I had Lori on and we broke down her idea of a business that she wanted to go in and we really weren’t even thinking about starting necessarily like on Amazon. If you’re selling a garlic press you might have a garlic press cleaner, well then someone else does the same thing. So, there’s really no way for you to compete other than just keep doing what everyone else is doing. What I’m about to share with you and you guys already probably have heard me talk about this is like building a brand and what does that mean? I was actually on a call the other day and it was a 30-minute private coaching call which was not recorded and that was done for one of our students that actually won this 30-minute coaching call with me. So, we got on and they said, “What does it mean exactly to build a brand?” Does it mean that I’m just branding my products and now I’m a brand or does it mean something different? And I said, “Well, it definitely means something different.” Just because you put your logo on the product, doesn’t mean that you’re now a brand. There’s more to it. We’re talking about an audience or maybe getting the attention from the market. [00:03:59] Scott: But then being known in that space or even if you’re not known like this big major brand, you’re still able to take them through a buyer’s experience or the journey that you want to lead them through versus you just putting up a product on a platform, they search for it, they find it, they buy it. So, that’s really what we’re talking about. How do you give value to the market? How do you create assets in your business that will allow people to come to your brand and then get educated or additional training or even fun? Like, I know with the GoPro like if you have a GoPro, you’re encouraged to go use it and then share your video on YouTube and then you’re basically selling the brand for the brand. That’s what you’re doing because it’s fun and you want to share your shots and I had that actually a similar experience on a lens that I bought for my iPhone and they said, “Once you start taking amazing pictures, post it, tag us,” and what do they do? They use those as proof that people are buying in the brand and people love looking at all of the different pictures people were taking. So, it’s a great way to get the community built. So, with that, all being said and that was a mouthful. I didn’t mean to do that, but I needed to explain everything here and why I wanted to really do this episode. Now, this episode also is part of a YouTube training that I did. Now, you guys may or may not know I am doing something right now as kind of a little bit of an experiment. For the next six to eight weeks, every Wednesday on YouTube I’m going to be going to my whiteboard and I’m going to be drawing out the things like this, the three pillars of building your brand to dominate your niche. And I’ll actually show you and diagram everything and kind of how it flows together. A lot of times I’m more of a visual learner when I’m especially doing stuff like this. So, what I’m going to be doing on Wednesdays on YouTube is I’m going to be sharing with you really deep diving and giving you guys the training about building a brand. [00:05:57] Scott: So, if you’re interested in checking that out, definitely head over to TheAmazingSeller.com/YouTube and then all you have to do is subscribe to that channel and then also if you would click that little bell. When you see that little bell icon, I believe it’s up on the top right depending on the device that you are on, and then you’ll be notified when I either go live or when a new episode is posted. Right now, I’m going to be committing to the next six to eight weeks and we’re going to be doing this on YouTube exclusively. All right. So, what I’m going to give you, guys, is kind of like the high-level view right now and then we’ll dig in deeper on the YouTube training because it will be video. I’ll be able to share with you on the whiteboard. The other thing is the show notes to this episode can be found at TheAmazingAeller.com/525 and then the last thing is if you are just starting and you have no idea of where you should start or as far as like maybe picking a market, any of that stuff, definitely check out our boot camp, TheAmazingSeller.com/Bootcamp and get all the details there. That’s where we really identify a market, a submarket, a niche, “neesh”, however you want to call it and then from there we find products to serve to that market and then we can build the brand. All right. So, let’s jump in. The three pillars of building your brand to dominate your niche. Pillar number one, this is what I call home base. I think every business needs to have a home base. What do I mean by that? Well, you need a website and I don’t think it just needs to be a website where you have like your homepage like that’s it. It needs to be a blog. I call it a blog in a sense because we’re going to be always adding new stuff to this blog. Now, don’t get overwhelmed if you think you have to post something all the time. I would though get into a habit of posting at least once a week or at minimum once every other week, but I’d get on a schedule and I would do that and there are ways that you can find what your market wants, what they need, what they’re looking for. [00:07:57] Scott: And then just a byproduct of doing this, you’ll start to get some outside traffic from Google, Yahoo, Bing, all the search engines just from posting here on a regular basis. But this is our home base. This is where we want the traffic to eventually go or we want them to learn more about us and go here and then see that we have all of these other information that could also help them and educate them and maybe even humor them depending on your product and your market or your brand. So, a blog to me and a website is really the home base. This is where I get to control the experience. This is where I can lead people and I can capture email addresses, I can drop a Facebook pixel on there and eventually follow up with them again. I can let them know of my social media platforms. I could tell them a story about our business. All of that stuff, that’s our home base. No one can ever take that from us. As you’re building the home base, as you’re building out your home in a sense, your online real estate, you’re actually building it to be with more authority. And what I mean by that is as you buy your domain name so whatever it is, XYZ.com, you buy that domain, now all of a sudden it starts to get history and Google knows this and then over time the content that you’re publishing will start to get indexed just like Amazon indexes their stuff. And then as people find your stuff and they start to like it, share it, maybe another blogger will find it and then share it, and then you’ll start getting these links coming to your blog and that will also help in what we call SEO, search engine optimization. Now, again, I’m not going to go into deep details here on that stuff. I will be going into more of that stuff though on the YouTube channel so definitely check out that at TheAmazingSeller.com/YouTube and you’ll find that over there on the brand building stuff that I’m going to be doing. Because that is important and there’s something that we recently did and basically these three pillars are exactly what we’ve done in the new brand. 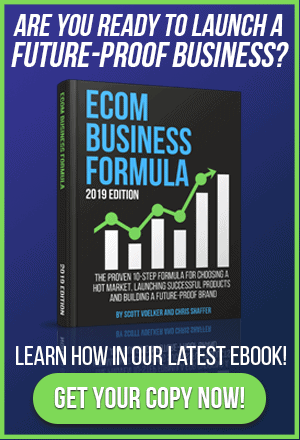 [00:09:59] Scott: It’s exactly what I’ve done in past businesses even one right now currently that’s still up and running in my digital products business, in The Amazing Seller, like all of this stuff is really these three pillars, having that home base. When I started this podcast, I started the blog not to necessarily publish like written content. It was really a place to house and to home or to call my home where I wanted the podcast to reside and then from that, it’s just organically started to get traffic coming to the home base, to the blog. Same thing goes for the new brand. We did this just as a byproduct started getting traffic. We’re up over 30,000. We’ve even touched 80,000 one month of unique people that are coming there, unique hits on the site and people coming through the site and learning and educating and finding our stuff because of this. So, a home base is really, really critical. I would definitely say I wouldn’t go to a free type platform like WordPress has a free, they have a free version of their software. That’s fine. I think if you want to use that, that’s fine. I just wouldn’t use like WordPress.org where they host it. You don’t want to go on a hosted as far as like them like what’s another, Weebly I believe is the other one. Wix might be another one. If they’re going to host it for you on there and they gave you, you could only use their platform, I don’t like that because then it’s kind of like you’re building your home base on rented land. I’d rather see you create or get hosting, HostGator, Bluehost, any of those and then install a WordPress blog on your host. That’s fine. Shopify, if you’re already on Shopify and you want to go ahead and attach a blog to that, you can totally do that. [00:11:58] Scott: So, just make sure that whatever platform you’re hosting it on, you can customize, you have the ability to in the future if you want to customize any of the code, any of that stuff, you want to make sure that you can do that because you don’t want to build something that you have to stay there and only use their platform. I know if I want to take my blog that I built on WordPress and I say built, I’m using the framework of WordPress, not their self-hosted. I’m building it on HostGator and then from there I can take that if I want to and I can migrate it over Bluehost and then my site will go over there. We can point the DNS, all of that stuff which is kind of techie stuff, but they’ll do it for you. They’ll actually point it to you and we can just pick up our piece of property and then move it over to another platform and then have our domain name pointed over to the new platform. So, I think it’s really important that you build the home base on your land. Now, yes, you’re renting it on HostGator or, yes, you’re renting it on Bluehost but that is just hosting. That means that it’s hosting it in the cloud. You can go and put that on other hosting accounts but still take your blog with you and to me, the one that I’ve been using for years is the WordPress platform. It’s not the self-hosted. There’s two different ones and again I’ll drop these links in the show notes so the episode here is TheAmazingSeller.com/525 and I’ll link that up. All right. So, that’s your home base. Really important. Okay. Really important that you have something that you can drive traffic to and also be found by the search engines so really important. Okay. That’s pillar number one. Pillar number two, you might be already or might be able to guess this one because of my past talks and discussions, is an email list. I think right out of the gate you should be building an email list and at the minimum, you should have an email capture form on your blog right from day one. [00:14:02] Scott: And I don’t care if it’s like five tips to catch more bass in a pond. If that’s your lead magnet in a sense or if that’s your offer to get people to join to do that or at the minimum sign up to receive our upcoming weekly tips, something like that, that’s not as good because it doesn’t call out the specific person that what they’re looking for but it’s still better than nothing. Now, I know a lot of people say, “Well, what do I use to build an email list?” We use ConvertKit. Now, we use that inside of our brand that we’re working on for Amazon and our e-commerce. We use ConvertKit. I’ve used AWeber in the past. They work fine. ConvertKit’s better because we can do some tagging and stuff like that. We are on ClickFunnels which also migrates with SendGrid. That’s a little bit more complicated, a little bit more robust. I don’t think that you need that and that’s why we don’t use that inside for email management anyway. We don’t use that for building our e-commerce brand. So, ConvertKit is what we use. Yes, we still use ClickFunnels in our new brand to do free plus shipping offers and that type of stuff but to build the email list it’s inside of ConvertKit. Any of our contest that we’ve built, we built them inside of GiveawayBoost but then we connect that to our email list, our autoresponder which is ConvertKit. All right. If you want to check out ConvertKit, you want to go through our affiliate link. You can do that by heading over to TheAmazingSeller.com/ConvertKit, all one word, ConvertKit. So, TheAmazingSeller.com/ConvertKit and from there you can grab all the goodies that the tool has to offer and, yes, you will buy us a cup of coffee and we appreciate it, but you don’t have to but a lot of people emailing me say, “Scott, are you an affiliate for this? Are you an affiliate for that? I want to go through your link. I want to buy you a cup of coffee,” so I just want to kind of throw that out there for you. All right. But I’m a huge believer in that tool and the company so definitely check them out if you’re interested and if you don’t already have an autoresponder. [00:16:04] Scott: And we’ll talk about autoresponders and how they work and how to write a good sequence and all of that stuff. I’ll be definitely doing that mapping that stuff out on the new show on Wednesdays and that will be on YouTube and I’ll be drawing that out on the whiteboard. So again, now a little call to action here, guys, head over to that YouTube channel and check it out, TheAmazingSeller.com/YouTube. I got a lot of cool things I’m going to be sharing with you. All right. So that’s number two, building that email list. I’m going to show you how we can use that email list once we get people on it. I don’t care if it’s five people or if it’s 500 people or 5,000 people. We’re going to use it the same and it’s a way for us to connect with those people in our market but then also we can amplify some of our content whether that’s on social, whether that’s on our home base, whatever. We can also use that asset now to run Facebook ads because now we can create a custom audience and we can do look-alike audiences and we can do retargeting, and all of that fun stuff but we need a home base and we need the email list capture form and we want to put that in our home base, step one. So, the email list really, really important and again I’m not going to go into much detail here, just understand that we are going to be using that in the future and that is another huge part of building our three pillars in our brand that can really, really separate us from the competition so that’s number two. Number three, external channels. Now, I don’t mean going out there and getting on all of them and using all of them. What I mean by that is external channels are how are people going to be able to find us? How are they able to – how are we able to get their attention? How are we able to go over to another platform like YouTube, like Facebook, like Instagram, Pinterest, whatever, and get the attention and then bring them back to our home base? Like, how are we going to do that? So, I’ll talk about that but let me just be very, very clear. You need to think about your market and where they’re hanging out. [00:18:04] Scott: If it’s YouTube, that’s where you go. If it’s Facebook, that’s where you go. If it’s Instagram that’s where you go. Now, there are some pros and cons to these different platforms and I think we should probably discuss them really quickly. Okay. Number one, YouTube is great because of this. The content that you create there is pretty much evergreen and what I mean by that is when you create a piece of content, it lives on today, tomorrow, and way into the future. So, you can create a piece of content that if you do it right will be found years from now and that’s going to lead people back to your home base or to build up your channel. Now, there’s going to be some different things you can do with YouTube and, again, I’ll be talking more about this because I’m actually doing more of that right now myself but I’m going to be sharing that with you on my YouTube channel but also here on the podcast because I think it’s important that you understand the framework of how to really go out there and build a YouTube channel that can have subscribers but then also can lead people back to your home base. But YouTube is great for that. The cons are, well, and I don’t say it’s a really a con. It’s a con if you are not comfortable on video, if you don’t want to shoot video, if you don’t want to do any editing or any of that stuff, you can find people to do this but at the beginning you probably want to do a lot of that yourself just so this way here you kind of have your hands in and you kind of understand the platform and really getting yourself immersed in the SEO of YouTube because YouTube is another huge search engine especially for how-tos or maybe unboxing your products or maybe reviews of your products or other people’s products on your channel to get some momentum. So, YouTube is great for a lot of different reasons but if you’re not good with video that doesn’t mean you can’t be good with video. You might have to learn it a little bit, again another skill set that you’ll learn that you’ll have forever. [00:20:02] Scott: But you have to understand that there is going to be a little bit of a learning curve there. I think it’s well worth it but the power of it is just huge and there’s a lot of different things that we can do and if you listen to the last episode, 524, I was talking to Lori about that. And that’s going to be her strategy moving forward and I talked to her actually about how to discover these hot topics in her space and really how to niche it down. If you listen to that episode, you heard us start with keto, a keto diet, and then we went keto diet for women and then we went keto diet for women over 40 or 40+ or then there was keto diet for women over 50. So, see, we niched it down from keto to keto for women and then over 40, over 50. All right. So, that’s how you kind of niche things down and in YouTube, it’s the same thing because then we can start getting the low hanging fruit of those search terms and then we can decide what kind of content we want to create. So, that’s your one was external channel. I would not say then do YouTube then do Facebook then do Instagram. Yes, we’ll add those in later if we can if our market is there, but we don’t have to start there. Now, Facebook is another one. You might just want to focus there. Maybe that’s where your audience is. You’re going to build maybe a group because you have a market that you’re in that would support having a community aspect of it and that’s great. That’s where you would go. The one thing with Facebook though that you’re going to want to do is you’re definitely going to want to set up at least at the minimum a Facebook fan page and I don’t care if you get one like or 100 likes or 1,000 likes. That doesn’t matter. You are going to eventually need that Facebook fan page to run a Facebook ad. So, that there is just like just create it, get a graphic made for the top or make it yourself, put it up there. At least you have that component in place. Now, if you have a YouTube channel, you can take that YouTube channel, connect it over to your Facebook fan page and it will automatically feed in your content into your Facebook page. [00:22:02] Scott: So, that way there you don’t have to post there and you’re going to start populating your Facebook fan page just because you’re posting on YouTube. It’s going to automatically connect it. Instagram. Instagram is very fast, so you have to think to yourself if I’m on Instagram what’s my point? Building up this list of followers that’s great and all but how are we going to get those people that external channel? How are we going to get them over to our home base? That’s where you’d use your link in your bio or you would use images that would direct them to go over there if you are having a contest. We’ve done that where we’ve run a contest. We told them to click the link in the bio and then that would take them over to a landing page which was on our blog and then once we get them on our email list, we’re able to direct them over to our home base, our blog, but Instagram is very fast paced. It’s not evergreen. If you look at YouTube, that’s evergreen, really evergreen meaning again people can find your stuff a year from now. On Facebook, they can too but not as much. They’re not going to go there to search. Really, Facebook again is your newsfeed, what’s current. And then Instagram is even worse in that case because that’s like every day it’s going to be changing. Every day it’s going to be changing. Pinterest it’s a whole another platform. Again, if your market’s there, it could be a great traffic source for you. And then SEO, your own SEO through Google, through Yahoo, Bing, any of those, SEO is another external channel that you’re able to start to capitalize on. Now, you can basically build your blog with some basic SEO principles which is really, really simple stuff and you can just start organically getting traffic, but you can also have a plan in place that you’re going to really go after keywords that are being searched for kind of like YouTube in a sense where you’re going to figure out those keywords and then you’re going to build content around those keywords. That’s another strategy but again you would focus on that. So, what I would really suggest doing is pick one of these, one, and then go all in on that one for a while. [00:24:01] Scott: Now, if you can piggyback a little bit without you doing much work like YouTube to Facebook then fine, do that. If you’re going to be posting a YouTube video on YouTube and you have a blog, a home base, well let’s embed that into a blog post and write a little bit about it and then we get SEO without doing a lot more work. So, we can piggyback off of these, but you really want to pick one to focus on and then that there again will be driving traffic back to our home base and then we’ll be building our email list because in our home base, on our pages, we’ll be having a call to action there to join our list. Maybe it’s a newsletter, maybe it’s five tips to catch more bass in a pond, whatever it is. That’s where you would have that there and you can have it at the top of the page, you can have it on the sidebar, you can have it in the post, you can have it all over your blog, your home base because you control it. You can have a banner if you want. Whatever you want to do you can do. Remember, your home base is your home base. You can set it up any old way you want. You can change your room around. It’s kind of like your house, if you want to change your room around you can. It’s the same thing here. You get to test different things, different placements, all of that stuff. So, here’s how I would do this again if we have the YouTube channel. So, post on the channel on YouTube. We embed it on the blog and then we write a little something about it because we want to give our blog a little bit of written content so again, and there are actually services out there that will transcribe a video for you. There’s Rev.com that’ll do it. They’ll do I think is a dollar a minute so for a 10-minute video it’s like $10 and then they’ll transcribe it and then you can embed that so now you get written content in the blog post. And then from there, we’d email the list and we would email our list to say, “Hey, just to let you know, we’ve got a new YouTube video,” boom, drive them over to YouTube or, “Hey, we’ve got the new blog post,” go to the blog post. [00:25:59] Scott: So, our email list is to really amplify that content once we have it and we can drive it over to different assets that we have. So, in this case, if I really wanted to get more views on that YouTube video because I know if I feed the algorithm in YouTube, more views and more comments, I’m going to rank better than that might be where I push the traffic. Then I might have another blog post that I want to really push the blog post because I know that if I get it in the right hands, it could get shared and then I could get backlinks and then my SEO gets elevated a little bit. So, there are different times that you’ll probably want to take that email list and direct the traffic to different places. Maybe you have a Facebook post on your fan page and your goal is to get it shared. Well, then you can say, “Hey, go on over and share the video I just posted on Facebook,” and then, boom, they go over there, they share it, and then you start getting traffic. Now, in that Facebook post, you’re probably going to have some calls to action to go over to your blog, your home base or your YouTube channel or your email list. So, you have all of these options that we can do once we have the content and then once we have these different components in place. Now, just to give you an example, this is what we’ve recently did when we were building this new brand, and this is what I advised anyone that has a Facebook fan page. Even if you only have a few hundred people, it doesn’t matter. It’s a great way to test new content and also see what people maybe need help with. So, what we do is we did a Facebook live on the Facebook fan page. We might have had 10, 15, maybe even 20 people watching live. No big deal but them after the fact, after the video ends, that video starts to pick up some steam because it’s starting to get shared, it’s starting to get liked because if I did a good job, I would’ve said, “Hey, do me a favor, like this, share it, comment.” I would’ve said all of that stuff and then that’s helping to get that video more eyeballs. [00:28:03] Scott: Then what we do is we look at the content. We go, “Oh, this one did really, really good. Let’s create a more polished version of it or re-upload that to Facebook and then we can write a blog post about it then we’ll embed that into the blog post,” and now we’re getting a little bit of juice from YouTube over to the blog and vice versa, blog to YouTube. And then we have an email capture that’s on the blog or in that post and then we’re building that email list and that’s exactly what we’ve done. So, we’ve built a nice size list over on Facebook. Okay. I think we’re just under 15,000 and then from there, we built an email list over 30,000. Right now, we’re currently building a Messenger list inside of Messenger which is a whole other animal but again we’re building a list and then what we’re doing is we’re writing content and we’re driving it over to our blog or our Facebook page or we’re just asking people questions and doing surveys. So, what we’re doing is we’re able to test the content on Facebook then from there create the content that we know people want or what they need or maybe we discovered it from a comment that someone said, “Hey, I’m not really understanding how to do this. I haven’t seen anybody share on how to do X, Y, and Z.” And then you create a video that shows how to do X, Y, and Z. You post it, you tell your email list, and then you just push that content. And then you just continue to do this, but you have to get a schedule together and you have to be consistent with it. Even if it’s once a week, do this. So, let’s recap really quickly. Three pillars and these three pillars again is what we’re starting with, the external channel stuff, pillar three, we can actually add some to it to really give it more fuel and add it to the fire. So, number one, home base, your blog/website. Pillar number two, email list, Messenger list, custom audience, whatever it is, you want a way to be able to communicate with people and then drive them over to your content which will ultimately lead them back to your products. [00:30:07] Scott: So, that’s what we want to know there is pillar number two. And pillar number three is your external channels or channel if you start with just one, YouTube, Facebook, Instagram, Pinterest, your SEO Google, Yahoo, Bing, any of those. So, those are the three pillars that I think all businesses whether you’re starting, whether you already have one right now. Maybe you have a successful business on Amazon right now but you’re lying awake at night saying like, “Man, I hope that competition doesn’t come in and crush me because the only thing that I can compete with is price and a little bit of, yeah, I’ve got some reviews but how long is it going to take before they get more reviews because they’re going to do some shady stuff?” If you’re thinking like that, you need to do this and it’s not too late to start. It’s not too late to start. So, home base, email list, external channels. If you want to see me draw this out on a whiteboard, definitely head over to TheAmazingSeller.com/YouTube and subscribe and you will get all of my brand building tips and advice and drawings over there on that channel because that’s what I’m going to be doing here on Wednesdays. So, every Wednesday I’m going to be posting a new episode and by the time you listen to this, it will be there for you to watch. All right. So, guys, that’s it. That’s going to wrap it up. The show notes can be found at TheAmazingSeller.com/525 and you can grab all of the show notes and goodies over there and, yeah, that’s it. That’s going to officially wrap this up. Remember, guys, as always, I’m here for you, I believe in you and I’m rooting for you, but you have to, you have to, come on, say it with me, say it loud, say it proud, take action! Have an awesome amazing day and I’ll see you right back here on the next episode. 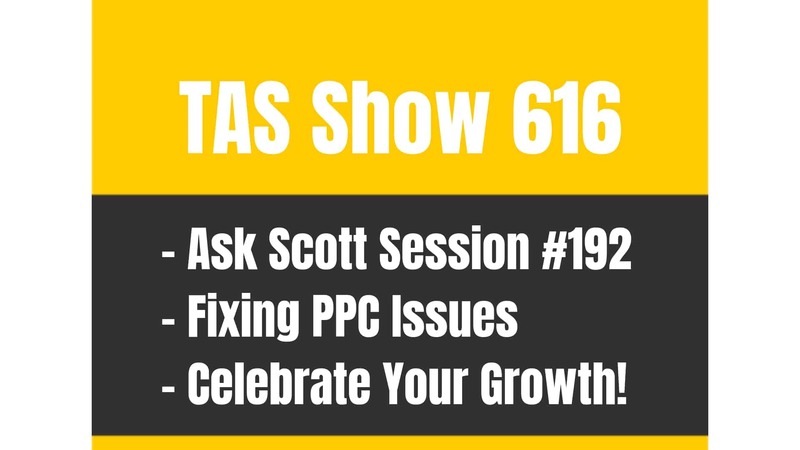 TAS 616: Ask Scott #192 – Do My PPC Campaigns BID Against Each Other? Amazing as usual Scott man. I totally agree with you about building personal brand, to grow a audience and become an authority in that space.